The challenge for the modest sloping block (551 m2) was to capture the view whilst not compromising on the sustainable features of the home. 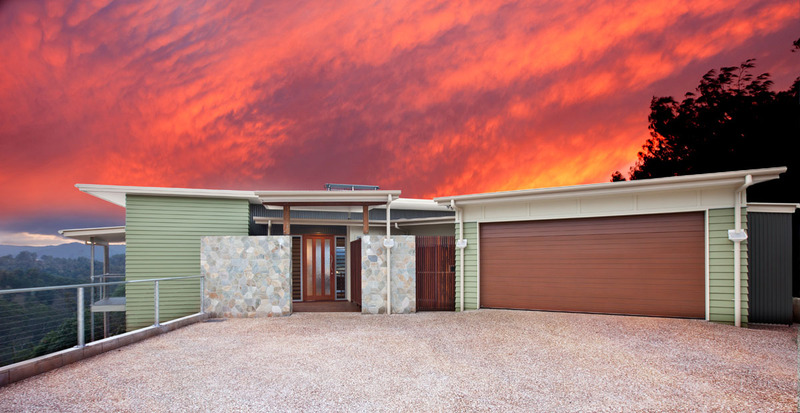 Spread over two levels; the three bedrooms, 2.5 bathrooms and study are complemented by a large garage with an innovative built in storage area to utilise excess space. 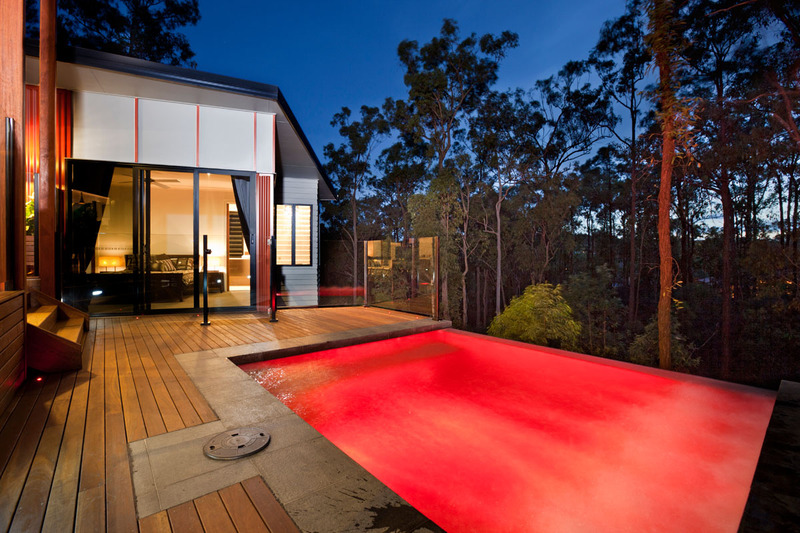 The most striking feature of the home is how it is orientated on the block. The design was given a twist to capture every little breeze and take advantage of seasonal changes. 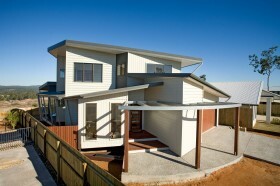 This highlights how you don’t need lots of land – Greensmart principles can be applied to any suburban block. 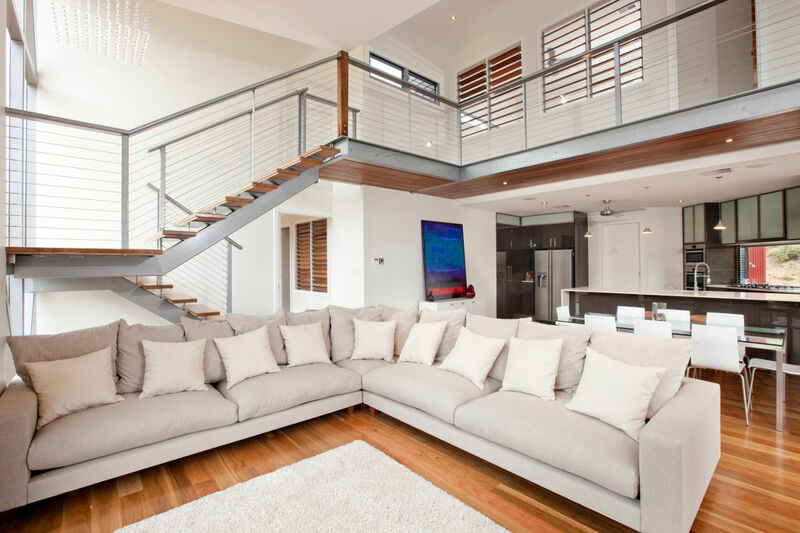 Simple, natural cooling features have been used extensively throughout the home: an old-fashioned breezeway; standing the house on piers to ensure maximum airflow underneath; high ceilings and louvers are just some of the features of the home. 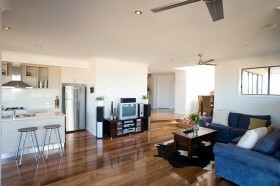 All rooms are insulated as added protection against the fierce Queensland heat. 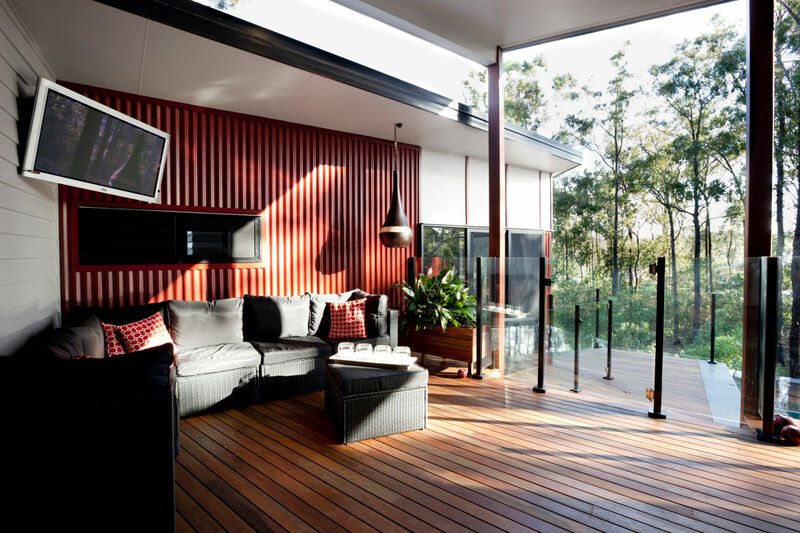 Hot air is moved out of the house by fans in every room ensuring energy efficiency in every area of the home, including the rear deck whilst large roof overhangs reduce the amount of sun on entertaining areas and a fan circulates air on the rear deck. Placing the home on piers meant that no cut or fill was required, minimizing the impact of the house on the environment. An added bonus of this method is constant air circulation underneath the home. The only earthworks completed on site were leveling for the garage pad – the only slab in the structure. Under the rear deck hides a 6,000 litre water tank. 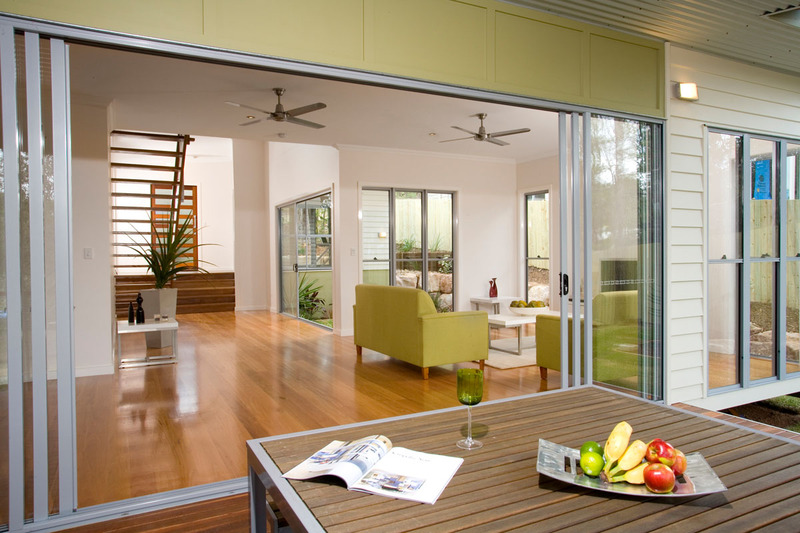 This maximizes the outdoor space available – a critical element on a small block. Access to the tank for maintenance is via a custom built gate under the deck and all external taps are hooked up to the water tank to facilitate efficient garden management. 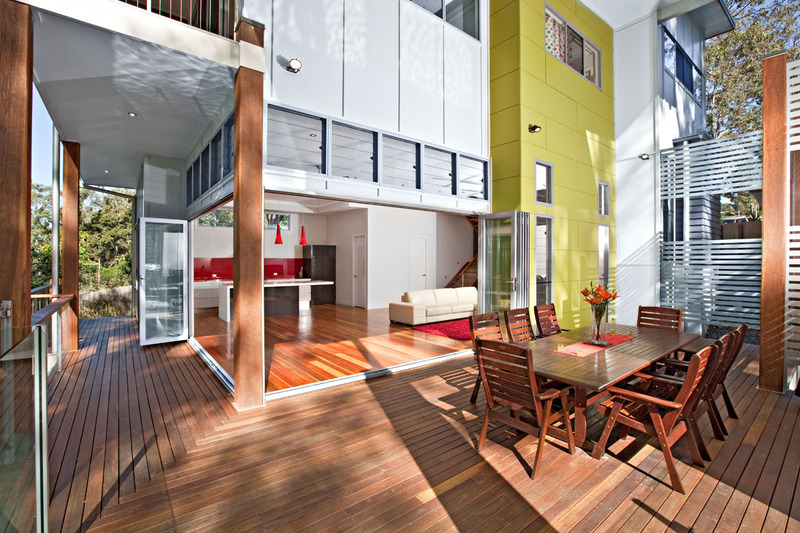 The environmentally conscious features of the home also extend to the choice of materials. 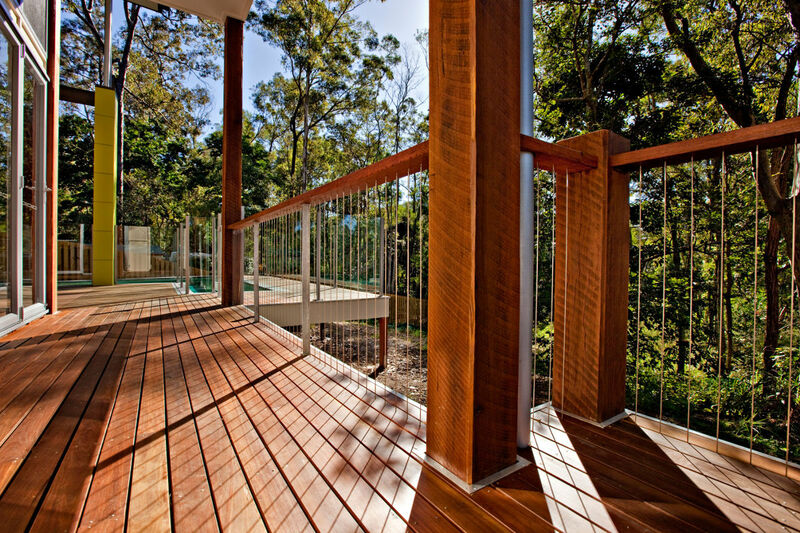 The timber floors and decks are from renewable forests and galvanized steel has been utilised to eliminate costly maintenance. Externally, Eco Ply, Colourbond sheets and FC New Line Weatherboards were chosen for their low maintenance and lightweight construction elements. The most striking environmental feature is the 6 metre void extending the full height of both floors. The void as a chimney flue to draw hot air up, which is then expelled via louvers and a fan at the apex of the void. Two bedrooms overlook the void and it is open to the internal stairs to maximize air flow upstairs as well as down. Cedar shutters have been placed in the bedrooms which overlook the void to provide privacy and block out noise from the lower level. 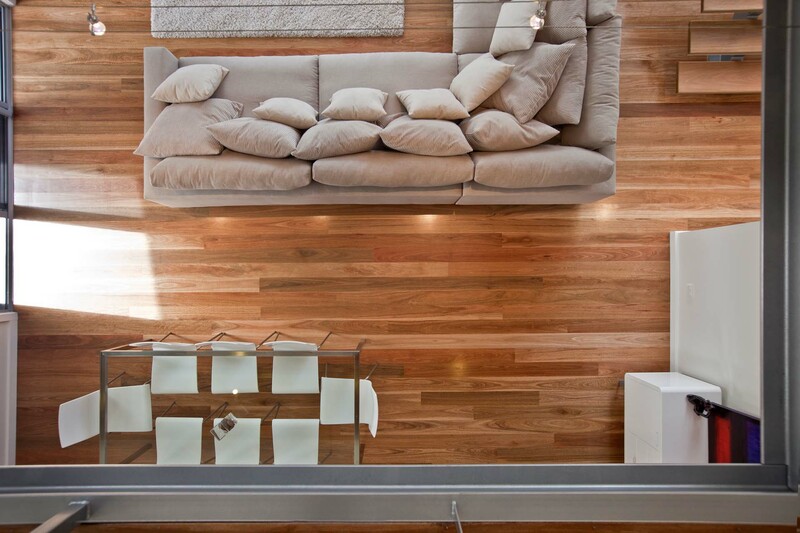 The home is finished in neutral tones which highlight the natural colours of the timber floors and stone of the kitchen benches. To ensure a clean, fresh look the same doors were used throughout the home and sleek brushed satin chrome handles complete the look.